With summer here, families all across Halton are taking their children to local swimming pools and water parks where they can enjoy the cooling play and have some fun. What a great way to spend a summer day. Not to put a damper on the day, but there is a mild skin illness called Molluscum contagiosum that becomes more visible during this time of the year. It’s a skin condition that is often misunderstood, and some parents might be concerned that their child may become infected and they may even stop their kids from taking part in activities such as swimming or playing in water parks. This measure may not be necessary. There is a great health benefit from being active and with only a few simple precautions, the spread of molluscum contagiosum virus (and other germs for that matter) can be prevented. Picture of Molluscum bumps, from Centres for Disease Control and Prevention: USA. Click on picture for more information. The molluscum bumps may resolve without treatment after several months. If, however, the growths are on the face or if they are bothersome, a doctor will prescribe an ointment for the skin lesions or will remove them by scraping or freezing. It is a good practice to check with the doctor for a medical assessment especially to make sure the rash is not caused by a different skin illness such as allergic dermatitis or eczema. How can I protect my child from molluscum contagiosum? Hygienic measures are the best way to prevent the spread of this contagious skin infection. The virus is spread mainly person to person by coming in direct contact with the skin of an infected person. Scratching lesions and then touching shared objects can spread the infection, but it is not easily spread this way. Simply by washing our hands frequently and thoroughly everyone can prevent spreading germs, and it works both ways – not to pick up any germs and not to pass them further. Wash in the shower before and after using the swimming pool. This is a good general hygienic practice, but the virus itself is not likely to be transmitted through the pool water. 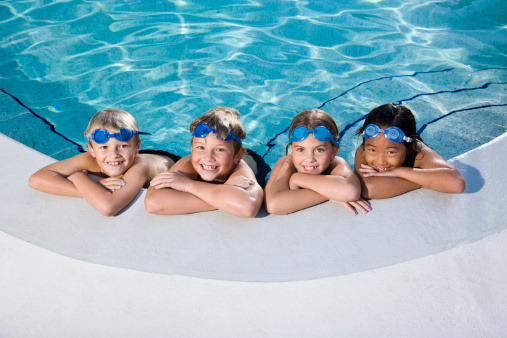 Children with open sores or skin breaks regardless of the cause should avoid swimming in pools. This helps prevent germs from entering the open sore, causing new infections and prevents infecting others by having germs leave the open sore. I know that all of this talk about skin rashes and viruses might make you think twice about going swimming with your kids, but don’t let it stop a great day at the pool. Simply stay clean or talk to one of us at HaltonParents if you have any further questions. Lucia Salagean is a Public Health Inspector and Specialist in Infection Control. She has worked for the Halton Region Health Department, Health Protection Services since the year 2000. She has experience in health care overseas, paediatrics and parenting. She enjoys spending time with her family and is the proud mother of two wonderful sons who are now Engineers, one working in Halton and one in Toronto. This entry was posted in Babies, Children & Tweens, Keeping Your Baby Safe, Keeping Your Child/Tween Safe, Keeping Your Toddler & Preschooler Safe, Toddlers & Preschoolers and tagged children, contagious, disease prevention, Molluscum, Physical Health, pool, rash, red bumps, skin, swimming, virus. Bookmark the permalink. 2 Responses to Kids swimming with Molluscum? Thank you Sidney for you comment about potential rashes when pregnant. Always a good idea to have any symptoms checked out by your doctor, and we all know that you see your MD/OBGYN/Midwife etc a lot during pregnancy… and they can help solve the mystery & if there is anything to worry about or necessary treatments. This is a great post to relook at with summer coming and kids swimming in public pools. I know I am so looking forward to being active with my kids, now we just need it to stop snowing!